As a journalist, I cover games, not movies, so I couldn't help but wonder what I was getting into as I popped Second Skin into my DVD player. As a long-time World of Warcraft player, I had to chortle at the machinima depicting an in-game battle - everybody knows that that's not what fights in WoW look like, duh! And why would a Feral Druid be wearing the Restoration-oriented Stormrage armor? Even so, as a viewer and a human, I couldn't help but get drawn in. Let's step back a bit. 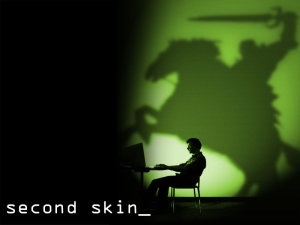 Second Skin, directed by Juan Carlos PiÃ±eiro Escoriaza, is a documentary about Massively Multiplayer Online Games - MMOGs - and the people who play them. The film focuses on three stories: A couple who fall in love over EverQuest II and eventually move that love into reality, a quartet of friends and housemates in Indiana whose lives change as some of their number have to adapt to the responsibilities of having a family, and a World of Warcraft player whose addiction to the game quickly spirals out of control and consumes his life. Those three stories are the ones the film focuses on most intimately, though they aren't the only ones by any stretch of the imagination - over the course of the 94-minute documentary, I met (so to speak) a gigantic guild that had been playing together for years and held gatherings with over a hundred people, a mother whose child had been lost to a virtual world, and a disabled gamer who was able to express himself, spread his wings and thrive online in a way he physically could not in reality. These stories are interspersed and supported by experts and people in the industry offering statistics and anecdotes from their experience. While those statistics are all interesting in their own right - did you know that one out of every three female MMOG players will start a relationship with someone they've met in-game? I didn't - the facts and cold hard data really take a back seat to the intimate looks at how these games and online spaces have genuinely changed peoples' lives. That's a good thing, by the way. As effective and interesting as the expert analyses are about the nature of these synthetic realities and how they relate to the very real world around us, it is really the personal element that makes Second Skin such a very compelling film. At times, it is intensely uncomfortable: As someone who has spent considerable time in the past few years playing MMOGs, there were times when these stories felt all too familiar, whether for events that had happened to me or for things that had happened to others. Beyond that, though, these are people baring important parts of their lives, and that's something that is very easy to relate to and understand even without a frame of reference. With Second Skin, I found myself getting drawn into the stories and these people as the film progressed, genuinely invested in what was happening to them, for good or for ill.
Perhaps the most refreshing thing about Second Skin is that it doesn't really have a visible agenda. There are no sweeping conclusions about whether these games and virtual worlds are good or bad for humanity to get in the way of these people telling their stories. Instead, the film simply and quietly informs (or reminds) viewers that these worlds are here, millions of people play them, and they are important. Beyond that, Second Skin presents these stories and these people telling them as they are, and allows you to draw your own conclusions. Bottom Line: For those familiar with these games and the MMO genre, it's an even-handed and respectful look at people and situations you might well have experienced yourself. For those who have never once set foot inside Azeroth or Norrath or Vana'diel, the personal stories may feel unbelievable and surreal, but no less compelling. Slickly put together and presented from start to finish, Second Skin is at times haunting and uncomfortable, and at times touching and poignant. Above all, though, Second Skin is an incredibly comprehensive and absolutely fascinating look at virtual worlds, the people who live in them, and why. Recommendation: Gamers - especially MMOG fans - should check it out, and make all of their friends who don't play games watch it with them. Parents with gamer kids might want to watch it together. Seriously, it's really, really good. Second Skin is having theatrical runs in New York, LA, Austin, Boston and Colorado in mid-August, and will be released on DVD everywhere on August 25th.